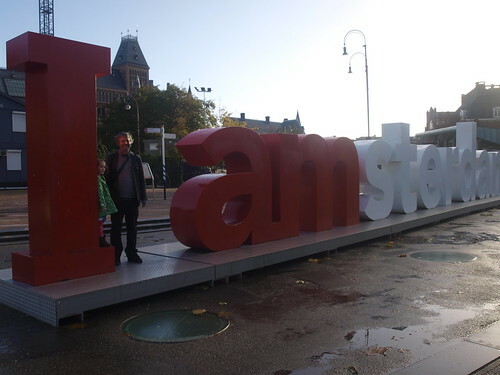 We got back from Amsterdam at about mid-morning yesterday after a rather sleepless ferry-crossing (Item had her periodic leg cramps), disembarkation at 6.30, and a rail-replacement journey in a coach between Harwich and London. Item went straight to a birthday party and then trick-or-treating! But we knew she had had enough when she burst into furious tears upon being told it was "trick or", not "trickle treating". 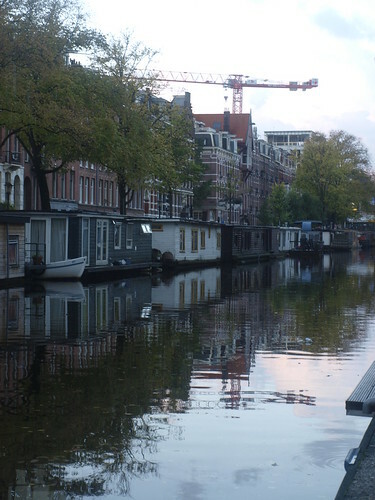 We had an excellent time in Amsterdam and despite our avowed intention to relax, packed an awful lot of shopping in. Item, cyberchild that she is, wants me to write a public post for other families planning on taking kids to Amsterdam, so when I can get my head round that, I'll update. Maybe a sensible day at a time, like huskyteer did. This is the view from our houseboat. I miss it already.